When it comes to return on investment in social media, many brands and marketers tend to apply old-fashioned thinking to intangible factors. The ROI of social media exists. It has been proven. Unfortunately, what works for a brand may not work for another. That is where targeting and specific KPIs come into play. In this day and age, most marketers use social media, emails, and paid search to generate leads, increase sales, and/or boost brand awareness. And, as Webmarketing123’s 2015 State of Digital Marketing Report reveals, they are quite confident in the effectiveness of the latter (51% of B2Cs) and emails (66% of B2Bs). With that said, things get tougher when they have to deal with social platforms. One third of marketers cannot pinpoint the ones that have the biggest impact on revenue. Actually, only 27% can actually prove any form of ROI. And attribution models are non-existent in 38% of cases! 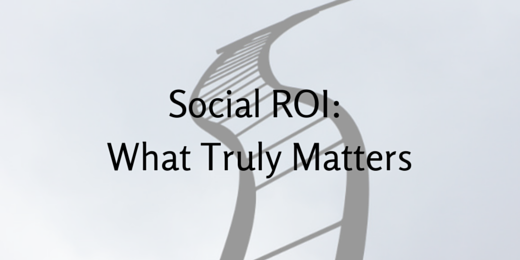 So, why can’t marketers really measure the ROI of social media? According to the study, they rely too much on gut instinct and a very limited set of metrics – conversion rates, website traffic, and total lead volumes. Only 9% of B2Bs and 12% of B2Cs actually track total revenue brought in by digital marketing. While there have been improvements in the mobile area, 36% of B2B marketers and 25% of B2C marketers still don’t have optimized sites. Responsive design is on the horizon, though, especially in the B2B segment. Now, there are good news. Marketers are finally embracing videos. 3 in 4 use the medium in their content marketing and 7 in 10 believe it is more effective than eBooks, case studies, infographics, webinars, blogs and mobile apps. Further, blogging has almost become mainstream. Half of B2C marketers and 60% of B2B marketers have a blog. Unsurprisingly, LinkedIn remains the most effective revenue driver for B2B marketers (37%). B2C marketers still prefer Facebook (56%). The results of the study are available for free here. Is Users’ Ad Blindness the New Black? While only 50 people participated in the experiment, the results highlight an increasing trend: ad blindness. On average, fewer than 2 in 10 posts generated any response. Actually, sponsored content showed a complete flat line! The goal of the study is not to discourage you to use Facebook advertising, which remains a viable option. Instead, see it as an invitation to change your focus. Stop banking on the “build it and they will come” approach. People consume huge amounts of digital content every day, so yours is up against fierce competition. People’s attention and clicks come with a price: value and strong emotions. “What new networks such as Vine and Snapchat have taught us is that intensity is popular, especially amongst Millenials, so by applying that thinking to the rest of our creative, there’s more chance of grabbing the target audience with their new, 6-second long attention spans,” says Amy Kean, head of futures at Havas Media. Investing in video content is always a safe option, especially on Facebook. As mentioned in last week’s roundup, it is now the format that gets the most traction on the platform. Interested in understanding the resources consumers use throughout the path to purchase? Check out the highlights from Social Media Link’s latest Social Recommendation Index, an annual survey of 24,000 active social media users. Consumers do a lot of research before buying anything. A majority favors Facebook and retailer / brand websites, while 40% settle for blogs and / or Pinterest. They also visit Instagram (38%), YouTube (37%), and Twitter (28%). Finally, brand-owned communities play an important role for more than 3 in 10 people. Consumers love reading recommendations and reviews, especially if they contain personal stories (83%) and lists of pros and cons (74%). And they know exactly where to find trustworthy ones: on Facebook and brand sites. However, do not discount other platforms. For example, Pinterest and YouTube are gaining serious ground: 64% and 59% of users trust them. Close friends and family members continue to strongly influence people. One in five respondents even stated that reading one review from them is often enough to trigger action! Advertising (22%) and celebrities (11%) have the lowest impact on purchase decisions. A warning to bloggers. Consumers are more receptive to reviews written in exchange for free products than paid recommendations (77% vs. 48%). Once they have purchased a product, consumers will announce the news on major social platforms, including Facebook (54%), and on blogs (26%). They will also leave a review if their experience with the brand was positive, or received a coupon or a free product / sample. People love sharing opinions and helping others make better informed decisions. That is why they are very likely (71%) to tell the world about their negative experiences. Takeaway: Consumer advocacy requires a lot of listening. Make sure you monitor conversations on major platforms to address issues accordingly. See you next Monday for a roundup of must-read social media articles from around the web!